If you’ve been into Capital Chiropractic & Rehabilitation Center, you’ve probably heard us talk about the whole foods nutrition perspective called Whole30. Whole30 is simple: You cut out processed foods and added sugars for 30 days. It’s designed to help reduce inflammation in your body, reset your palate, bring mindfulness to your food habits, feel better in your body, and help you observe how different foods may affect you as you reintroduce them (if you choose to) at the end of 30 days. Our patients have found all kinds of outcomes from trying Whole30, from losing a few pounds, to feeling more awake in the afternoon, or sleeping through the night. Many people with “sweet tooths” return in shock of how much sugar they used to eat and now no longer crave. Others have reported that their new awareness around food’s affect of their bodies was nothing short of “life-changing.” Of course, outcomes vary from person to person. Our perspective is Whole30 is worth a try for anyone looking to lose weight, curb a sweet tooth, reduce pain from inflammation, improve sleep patterns, smooth out mood swings, or a whole host of other benefits. It’s simple, sustainable, educational, and low-risk. We also like the big idea that food contributes to your health, both positively and negatively. Think you might give Whole30 a try? Congrats! To ensure a successful experience, preparation and consistency will be key. Check out our go-to resources below to help get you started and keep going throughout your 30 days. You’ll find delicious recipes, practical tips, and daily inspiration. Good luck and enjoy! Not sure where to start with your Whole30? Maybe this is your first go at it, or maybe it’s been a while since the last time. Either way, make it easier on yourself by walking through these steps. 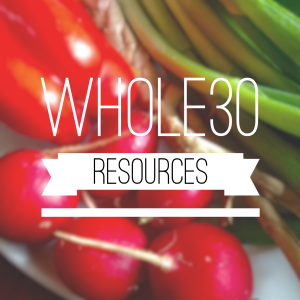 Looking for a daily dose of tips, inspiration, and reminders to focus your Whole30 experience? Try this email subscription from Whole9, the founders of Whole30. It’s $14.95 for a month. Find Whole30 approved foods for sale, including compliant herbs/spices, bars, snacks, jerky, and Whole30 starter kits. Order online and they will ship directly to you. Get inspired with beautiful photos of recipes and tips, posted daily on Instagram. Featuring rotating authors and experts with plenty to share. Follow them at @whole30recipes or visit the site link above (Instagram account not required). Find mouth-watering recipes for any occasion in this 2015 cookbook from the Whole30 founders, Melissa and Dallas Hartwig. You’ll also discover practical advice for staying on course in tricky situations like parties or social events. A must-have for beginners and pros alike.